Chuck finally transferred my pictures from my broken laptop to the new one. 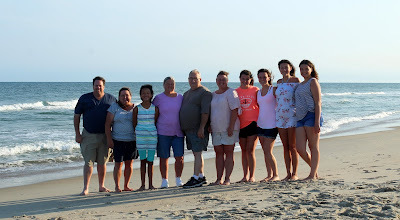 We vacationed in Hatteras, NC on the Outer Banks. Here we were crossing over Alligator River which means we are getting ready to drive down the North Carolina coast. Before heading off of the coast and out to the Outer Banks we stopped to see the ocean. Once over the bridge to the Outer Banks it's a beautiful drive. Driving down the coast is one of my favorite things to do. Finally we are at our final destination. While we settled in Megan hit the beach with her cousins. 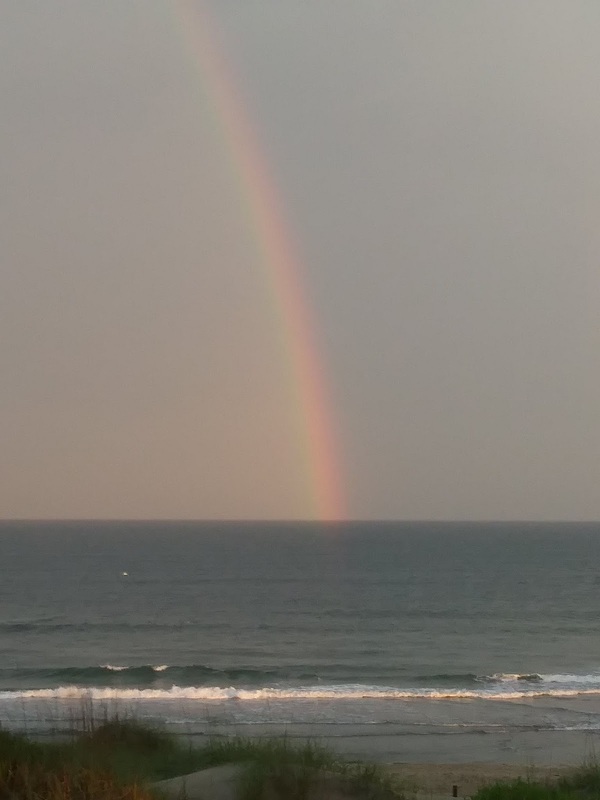 I snapped these pictures from the deck outside of our bedroom. One of the things Megan really wanted to do was fish. She picked up a new pole from a local shop and we went down early one morning. 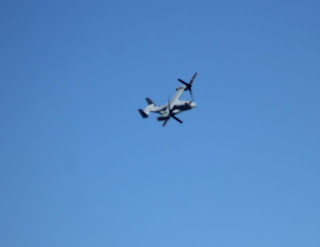 The first day we were there a V-22 Osprey flew over. Over the next several days we saw several different planes, including a F-16. We later found out that we were on the flight path for border patrol. 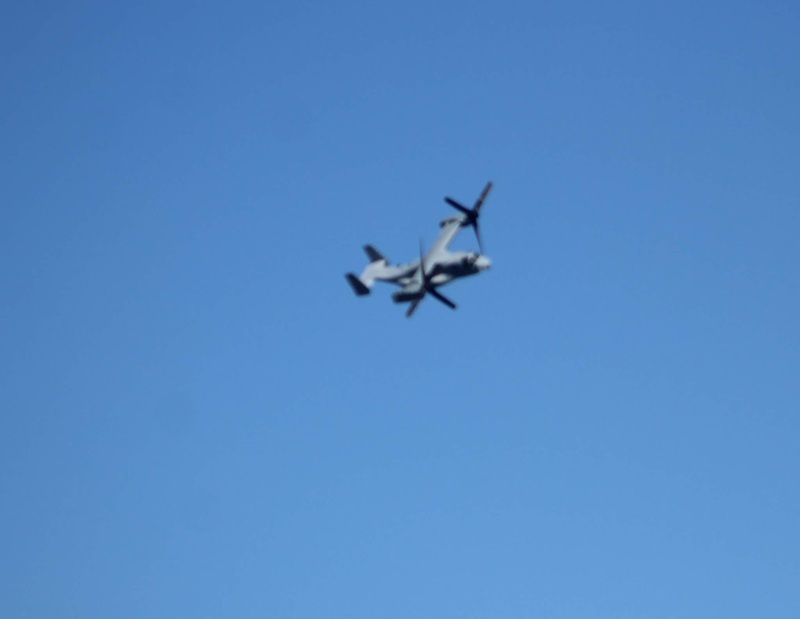 It was really neat to see the daily flyovers. 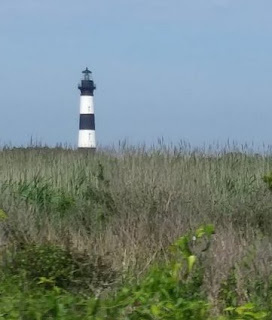 No trip to the Outer Banks would be complete without a trip to a lighthouse. We only went to one this trip. Right up the road from us was this lighthouse. The neat thing was that at night we could stand on our deck and see the light spinning around. We were much further down the island than in the past. That meant we weren't able to view the sunrise over the ocean. Regardless it was still beautiful. Megan found a couple of clams. She threw one back into the ocean was going to bring one back to the house. That is until it started to open. She quickly dropped it when that happened! An evening storm rolled through leaving behind a beautiful rainbow. We were about three miles from the end of the island. Chuck and I had the opportunity to venture out alone one morning. We went to breakfast and drove to the end of the island. We then sat on the dock watching the ferry run. No trip would be complete without a shot of the whole vacation crew. We vacationed with my parents and sister and her girls. Sadly my brother-in-law and nephew-in-law couldn't make it. It's always a great place to visit. We are already talking about our next trip. My daughter and her in law family just got back from a wonderful week at Top Sail NC. I am sure you added some amazing memories to your heart.